The project has been progressing through regulatory review since Canmore’s town council approved the project in 2015. As we wait for regulatory approval on the Springbank Off-Stream Reservoir (and will eventually need for a project on the Bow River), it is encouraging to see this large-scale flood mitigation project achieve approval. 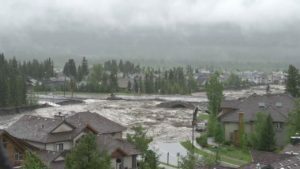 During the 2013 flood, about 90,000 cubic metres of debris inundated Cougar Creek in Canmore, which led to the evacuation of 1,200 residents from 300 homes. The Cougar Creek barrier will be 30 metres high and 95 metres wide, and will hold back 650,000 cubic metres of water and sediment in a retention basin for a number of hours during a major flood event. The structure will span a bedrock confined channel and will be comprised of a rock and earth-filled embankment, a reinforced concrete central sealing wall, and an open outflow with a throttle and debris rake. During normal weather conditions, water and sediment will flow unimpeded through the structure. The project’s construction costs are estimated at $38 million. The provincial and federal governments are contributing $44.87 million for project construction and ancillary activities such as the environmental impact assessment, structure design and dam safety review. Once begun, construction is expected to take 30 months. To read the full Environmental Impact Assessment (EIA) and related information requests, visit Mountain Creek Hazard Mitigation. To read a summary of regulatory applications relating to the project, visit Natural Resource Projects/Cougar Creek Debris Flood Retention Structure.